I went back to the same freestone from last weekend on Saturday. I decided to explore a different section I scouted on Google Maps. My plan was to park roadside and work up to a deep pool. I started the day fishing about a couple hundred yards downstream of where I parked. The stream in this section had ample pocket water with large boulders and trees providing good cover. I tied on a stimulator and went to work. The fishing was very good. I caught around 30 trout; a mix of brookies, bows, and browns. The brookies and bows were a mix of stocked and wild fish while the browns were all stocked. 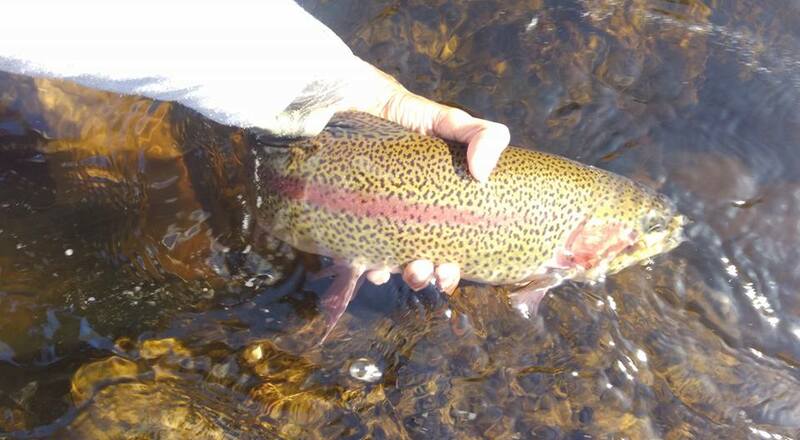 Even the stockies in this stream had perfect fins and great colors for the most part, although one bow I caught was noticeably stunted. I worked my way through stretches of pocket water and riffles. The only places I was finding fish were in shaded spots or deeper runs with fast water. I stuck with dries the entire trip although nymphs would have been probably worked better due to the difficult currents. The key was to keep as little fly line off the water as possible and fish almost tenkara style. When I finally got to the pool, I was disappointed to see that there was little current. Although it was at least 10 ft deep, I could see down to the bottom and didn't spot any fish. Contrary to how I stated it, I didn't just walk up to the pool, I took the necessary steps to methodically work my way upstream but still didn't get any hits. After catching a few more fish upstream, I walked back down to my car and went to lunch. I stopped my the Swift River along the Kancamangus on my way back. As usual, the vacation crowd was out so I stopped at a couple empty pull offs. I only caught one stocked brookie on a dry and that was it for action. The section I caught the brookie was a nice gorge with deep pools. The second section I fished was shallow and unshaded, making it a very unideal section. In the future, I think I'll fish it early in the morning or closer to feeders or further upstream.